Detection: The stream of solid particles enters a flow cell which includes a light source and a photomultiplier or a photodiode. The intensity of the light scattered by the particles is directly related to the mass of the eluted compound. Why Low-Temperature evaporation is important in ELS detection? In an ELS detector, the nebulized eluent is evaporated by going through a heated tube. The temperature of this tube is undoubtedly the most critical parameter when optimizing detection. If the temperature is too high, semi-volatile or thermally labile compounds in the sample may evaporate or decompose and will not be detected. SEDEX detectors can evaporate solvents with high boiling points at low temperatures. As an example, the SEDEX 90LT can completely evaporate a mobile phase composed of 100% H2O with a flow rate of 1mL/min at 32°C. Also, our innovative design provides performance that is superior to that obtained from systems which require a special low temperature device! A broad range of volatile additives can be used with LT-ELSD. Among these: acids (formic acid, acetic acid, trifluoroacetic acid…), bases (ammonia, triethylamine…), buffers (ammonium formate, ammonium acetate, ammonium carbonate…), ion-pair reagents (pentafluoropropionic acid, heptafluororobutyric acid…), these compounds can conveniently modify the mobile phase to separate complex samples. Elsewhere, other particular considerations should be brought to the mobile phase (low RAE), to the gas (clean and with a stable pressure), to the column quality (no phase “bleeding”) and to the HPLC equipment which should be in a good working condition. This diagram illustrates the selection of the droplets as a function of the size. 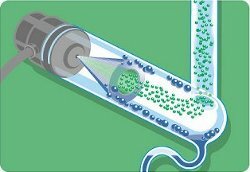 The mist of droplets is created by the nebulizer, and is composed of droplets of various sizes. The nebulization cell acts as a real Size Exclusion Selector, so that the droplets of largest dimension (in blue on Figure) are evacuated to the waste. 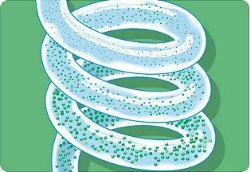 Only droplets which are below a size limit are allowed to flow through the drift tube. Most of our competitors’ ELSDs do not select droplets and require higher temperatures to reach acceptable levels of noise during the analysis, resulting in much lower sensitivities for semi-volatile and thermo-labile compounds. 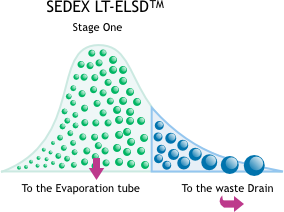 Selection of the droplets is a unique feature of SEDEX LT-ELSD and provides the real Low-Temperature evaporation, and the best sensitivity for all compounds.